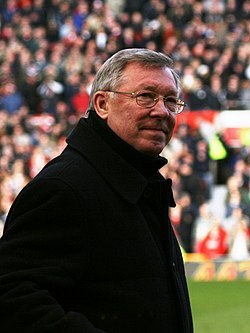 알렉스 퍼거슨(영어: Alex Ferguson, 1941년 12월 31일 ~ ), 또는 알렉스 퍼거슨 경 (Sir Alexander Chapman "Alex" Ferguson)은 맨체스터 유나이티드의 전 감독이다. 영어: I don't understand it, to be honest with you. I don't know why anybody can be bothered with that kind of stuff. How do you find the time to do that? There are a million things you can do in your life without that. Get yourself down to the library and read a book. Seriously. It is a waste of time. ─ 2011년 5월 웨인 루니가 SNS에서 팔로워와 논쟁한 것을 두고 충고하며. 이 문서는 2015년 4월 17일 (금) 21:24에 마지막으로 편집되었습니다.